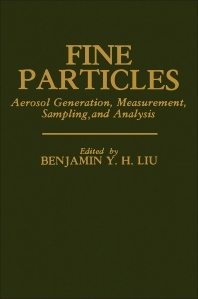 Fine Particles: Aerosol Generation, Measurement, Sampling, and Analysis is a collection of technical papers presented at the Symposium on Fine Particles held in Minneapolis, Minnesota, on May 28-30, 1975. The symposium aims to explore the developments in instrumentation and experimental techniques for aerosol studies. This book is organized into four parts encompassing 34 chapters that focus on fine particles below about 3.5 µm in diameter. Part I presents the research and development in Europe and Japan on fine particles and aerosols, as well as the aerosol standards development work at the Particle Technology Laboratory, University of Minnesota. This part also includes calibration studies on condensation nuclei counters and the diffusion battery. Significant chapters in Part II are devoted to the common techniques for generation of aerosols of various sizes, from fine particles to monodisperse aerosols. This part further looks into the equipment limitations and problems in producing fine particle aerosols for life testing air cleaning systems and for weather modification experimentation. Part III describes the techniques and equipment used for size-selective aerosol sampling in terms of the design principles applied, the correspondence between design and performance of specific samplers, their applicability to field conditions, and their ability to satisfy sampler acceptance criteria. Part IV deals first with the methods for determination of aerosol properties, including their optical, electrical, and spectral properties. Other chapters examine the principles, mode of operation, and application of processes and instruments for aerosol studies.